To be frank, in a year such as this with the vast changes to F1 cars and how they will have to be driven, it is astonishing that a team like Lotus should declare their development programme is better suited by not participating in the first test in Jerez. Of course it is cold early in the morning, and the circuit is doesn’t have the greatest surface, but test 1 is mostly a shakedown. It’s not about refining the machine or even the way the man at the wheel will drive it, though this year it will be surprising if the drivers don’t begin to learn about how they have to manage their resources. Lewis Hamilton will agree I’m sure. Having finally flown the McLaren nest, his big day came last year yet his first outing in the Mercedes in Jerez 2013 ended up with him in the wall and the team realising the brakes were not quite right after just a handful of laps. Lotus decision not to attend Jerez is indeed quite staggering. Yet TJ13 reported prior to Christmas that more than one team were concerned they would not make Jerez and today Eric Boullier is emphatic this will be the case. Speaking to the BBC the Frenchman claims, “You will see, we will not be the only team not being in Jerez (the first test in southern Spain),” he said. “I know this for a fact already. TJ13 is aware that Marussia are struggling to make the deadline, yet there is a significant difference between a team like Marussia and one who was challenging for race wins and for a while possibly second place in the constructors’ championship. Aha Eric! We believe you, but only for a split second. The most obvious difference to the Force India team in 2014, will be the livery of the car. Gone will be all Mallya group companies and in will be entertainment and telecoms logo’s and colours. It has been suggested to TJ13 that the billionaire Mexican Slim family have bought out Rob Roy (technically he was named at birth Subrata Roy.. oh well) of Sahara’s shares as he battles to avoid doing time in an Indian jail for ripping off millions of his fellow countrymen for billions of dollars. 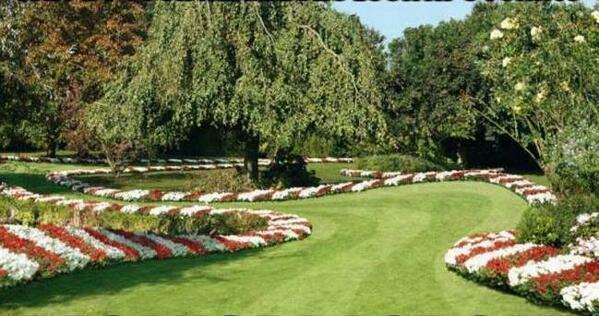 However, new shareholders and colours are not the only changes afoot at the Silverstone based team. The FIA regulations on noses have attempted to lower the nose from the 2013 iterations to reduce the effects during a T-Bone style accident. 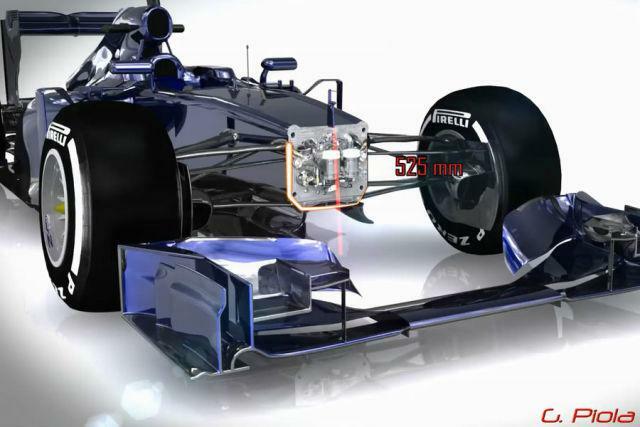 A secondary effect of the lower nose regulations is an attempt to limit the air flow under the car which can be utilised by the diffuser to gain incremental downforce. It appears that Force India maybe trying a version of the Red Bull flap seen on the RB8 and RB9 cars with the intention of improving downforce. 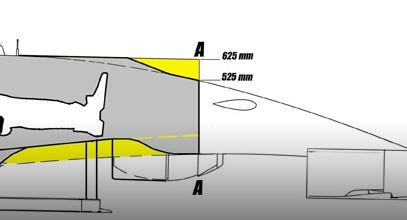 The new regulations insist the height of the nose above the front plane is reduced from 625mm to 525mm and a variety of tech interpretations have assumed the following will be the result. 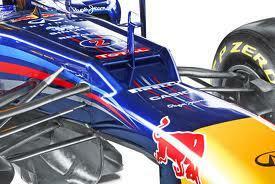 Here the transition from the chasis to the nose would be a continuous line. However, Force India are working on an interpretation which will continue to provide a step as follows. Red Bull played with the idea of an open slat as demonstrated above, though the trade off between increase in drag appeared to outweighed the benefit of the increased downforce. We will have to wait until Jerez to see if this is indeed implemented by Force India, but this would be an example of how the Silverstone team use relatively simple design concepts often devised first by others and re-work them. Repucom.net claim that the biggest benefactor in partnership with F1 is now Infiniti. They are the first F1 partner to exceed $1bn AVE (Advertising Value Equivalency) TV value and this despite live F1 being restricted for many to subscription TV. “The luxury car maker, which entered F1 in 2011, is now the number one most exposed team partner in the sport, measured by calculating the amount of on-screen branding of the official qualifying and race broadcasts”, claim Repucom. Nigel Geach of SVP Motorsport believes, “Excellent positioning of clear branding on both the Infiniti Red Bull Racing car, team and drivers in addition to significant airtime thanks to the team’s strong on-track performance throughout the year, gave INFINITI advertising equivalency value of over $1billion from Global TV coverage – an amazing achievement. $1bn??? If that’s the case someone in the sponsor contracts division in Milton Keynes ought to be hastily drafting up a new agreement for Infiniti. For F1 fans who were unsure why the ‘double points’ races appeared on the agenda – wonder no more. A certain vertically challenged individual from Suffolk is rubbing his hands as we speak. Having recently enjoyed the F1 media limelight where he waxed lyrically about all things F1 and his private Caribbean island, Eddie Irvine today has been sentenced by a court in Milan to 6 months in prison. Irvine was involved in a brawl in a nightclub in Milan in December 2008 with Gabriele Moratti – the son of an Italian politician. Corriere Della Sera reports that Mr Moratti encountered Mr Irvine in the “Holywood” nightclub, a brief scuffle developed between them. Mr Irvine claimed he was hit from behind by Mr Moratti and that he suffered damage to an ear. Following the incident, Eddie Irvine received threatening phone calls in his Milan hotel from an associate of Mr. Moratti. Both men sued. The incident was provoked by a text sent by Irvine to a former girlfriend of Moratti. Extensive appeals will probably see the case fall foul of the statute of limitations and spare the Irish ex-F1 driver the embarrassment of a having to wear a stripy uniform and break rocks. Yet, during the trial Judge Formentin believes certain parties perjured themselves whilst giving evidence and has passed the matter to the public prosecutors’ office for investigation. What indeed was in that text??? In days of yore an F1 fan could rock up to Silverstone most Wednesdays during the spring and summer months and watch an F1 car testing. Yet only a handful of people were usually there and the circuit made no charge for entry. Following the exodus of the car manufacturers’ works teams, in 2010 as part of the cost-cutting measures a ban on in season testing was introduced. Winter testing was organised by the teams and they would all pitch in to cover the $130-150,000 a day cost of hiring the circuits. Fans could attend and gain admission for free, and see the entire F1 field testing a car each for 8 hours a day. The rising cost of attending a GP and the lack of in season testing suddenly drew more and more fans to the winter tests and predictably the circuit operators saw an opportunity to earn a coin or two. They began charging for entry. It was a nominal fee starting at around 5 or 10 euro’s, but as the numbers increased the teams realised they had a bargaining position with the circuits. They refused to pay for the circuit hire on the basis that the organisers were making money from the fact they, the teams, were there. The circuits agreed not wishing to lose the event and the prices were hiked so the entrance fee started at 10 euro’s and it would cost double that to sit in the grandstand opposite the pits. Merchandise sellers arrived, paying the circuits for their pitch and the food outlets began to open to feed and water the fans watching a long days testing. Then in 2011, unusually the Jerez test included a Saturday and Sunday. The crowds had been around 3-4,000 each of the first two days. When the Ferrari engineers and mechanics set off for the track on this morning, it must have felt more like preparation for a day’s testing at Fiorano rather than Jerez, as the fog was thick and the air temperature around zero degrees Celsius. But Alonso was scheduled to drive for Ferrari and the queues outside the circuit had the feel that MotoGP was in town. The line of Maranello clad fans stretched for hundreds of metres at 8 o clock in the morning. Field after field was opened for overflow car parking and the circuit – which usually restricted fans to turn 1, the grandstand opposite the pits and the final stadium section – was opened fully. The food and drinks sellers ran out of products to sell by 11am and the circuit organisers were on the phone trying to organise emergency restocking. Every time the Ferrari went round, the Spanish fans should up, beat their ‘clapper sticks’ together, then sat down to carry on eating and drinking. No official number was ever released though local opinion suggested maybe 30 or 40,000 were in attendance. Sunday at the circuit wasn’t quite as busy, but again the fans turned out en masse and the refreshment stalls coped until about 2pm when again they ran dry. A number of drivers were surprised by the attendance and commented how fantastic it was to be testing in front of such crowds. There was a carnival atmosphere and many questioned why the winter tests weren’t planned so that they fell on the weekend more often; and of course the circuito de Jerez did very nicely out of the weekend. News travels fast in F1 land, and a certain small individual from Suffolk became aware of what had happened and particularly when there is an opportunity to make money. Later that year, FOM expressed an interest in setting the dates and running the winter tests, but this proposal was rejected by the FOTA and the other teams. There is though a strange legal clause somewhere in the mountains of agreements signed over the years that FOM do control the commercial rights at an F1 test event where more than one car is running. However, because most testing is done on weekdays and FOM do not control the scheduling of the winter tests, the commercials aren’t attractive enough for FOM. Again in 2013, moves were afoot as Ecclestone attempted to gain control over the scheduling of winter testing which he hoped to commercialise. However, this week, each team has received a letter from FOM stating, “We have decided it is better if the teams make the arrangements for tests as they have done so in the past”. Strange… and a shame as many Spanish and fans of other nationalities would probably appreciate the teams being forced to run part of the tests test at the weekend…..
…[Blinding flash of light]………Oh yes… I see. Two thirds of winter testing is now in Bahrain where they’ll be hundreds of police and security forces deployed to ensure the safety of one man and his dog. The Circuito de Jerez should then do even better this year despite the Tuesday to Friday test schedule, and some hotels close to the track were sold out back in November. Totally off topic now, does anybody know a good f1 manager game? Most online games are rubbish… or you have to pay for everything… back in the late 90’s I had a very good one on pc. The kind where you could manage a whole team. And didn’t have to drive yourself. Its free, but you can pay for a live viewer etc, but few do. If there was enough interest, we could set up our own TJ13 league! It has promotable categories etc. P.S I resorted to that reluctantly after realising the current stock of manager games are pretty awful. Despite my reluctance, and a general reluctance to ‘pvp’ after a few seasons I love it. I have been looking for a good f1 manager game. An active judge13 league would be great! …I like someone with a suggestion… please tell us more…. Sorry,But what exactly is meant by “f1 manager game”? ?Can you explain briefly? ?And when you say ‘live viewer’ , does it mean watching real f1 races live?? I shall perhaps write something for the judge in the future, about what this is and see if there is interest? I can set one up and organise it easy enough, but I’m really busy at the moment trying to get a book off to the printers, so perhaps in a week or so? Which book is this Adam? I still mess around with GPM2 every so often.. edited some files from the most recent mod (2011) and had a 2012 and 2013 season going.. There’s a great editor released by Danilo I think (small world eh! I was playing that game as a kid, hehe). I don’t know much about these online ones, but they sound like the next logical step. Real time competition online! I played on GPRO for two years until a couple of months ago (the only reason I quit was due to me being in the last year at uni, meaning I currently have no time for it atm), but not sure if it would be for you, due to saying you don’t actually want to drive yourself. But for those who would be interested, you have to control the driver you buy, finances, tyres you buy, tech director etc. Most people join a team (VERY ADVISORY), and obviously there is a team ‘leader’. You have to progress from Rookie, up to Elite. The game is free, but you can pay for ‘supporter credits’ – these give you past race replays, an excel doc of your performance, and if you have 5 supporters in a team (out of 10), your team can create their own livery. Apart from that though, you can easily play and advance through the game with supporting the game financially. I’ll believe audiences are holding up well when they decide to publish actual figures on the FOM report, not bland reassurances, LOL. As far as Repucom, seems like they measure the total screen time the name is on Telly then ask what the ad rates would cost. Which means that every race is pretty much an 1.5 hour Infiniti commercial. Of course, also Red Bull, wondering why they didn’t mention that. Plus pre and post and press conferences. Of course, not really buying that’s the actual value relative to targeted actual ads, but maybe that’s why Renault were doing a bit of sniping this season. Off topic a little but I’ve just seen a report where Massa claims that he is certain Alonso knew about crash gate as he lost the race to Alonso and that would have won him the title should he have claimed the extra points. Can you guys see if you can find out more please. Its being reported on F1 fanatic. Well, that is a very interesting story.. Now he’s left Ferrari/Alonso, Massa has basically said that he thinks Alonso knew it all along.. but would not say to Felipe of course. He will discuss it with Symonds to find out the truth and then move on for 2014. Who’s to say Symonds says it was Flavio and Alonso all along, with him caught up in the middle? Massa also says in the artical that he plans to face put Pat Symmons over it when he gets the chance round the back of the Williams garage…. i added the behind the garage but he defo says it’s in the cards. He must still be sore about the 08 season. Indeed, and as things turned out, it was his to lose in the end, and through a combination of unluckiness (Hungary engine blown near finish, Singapore etc.) and team errors he didn’t win the title (instead McLaren picked up the one they dropped in 2007 to Ferrari). He’d be better off concentrating on the main event rather then showing the world he DOES have a chip on his shoulder. Williams is his lifeline after all. I always wondered how Massa could possibly bw racing with Alonso in the same team, and even take orders, considering the crash-gate’s role in Massa losing his title bet in 2009. Off topic here also, but I was thinking about the recent terrorist bombing stuff in Russia; reports are that there are 37,000 military on guard duty for the Winter Olympics in Sochi. Is the F1 race in Sochi (a hotbed of Islamic independence activity, if I understand correctly) going to be a potential target? If I was the Russkies or the FIA I’d be worried. I guess it could be a secondary aim after the winter Olympics, yes. No doubt security will be huge.. I would say that the Russian GP is up there with the winter Olympics (possibly more important, as the winter Olympics aren’t really that big IMO). Using the same venue for both saves costs for now. Something will happen similar to the vodafone mclaren that occured during bahrain 2012,if the race runs in sochi. But beware the might turbo 1.6’ers are going rip the sochi tarmac. I don’t think it will be an ‘if ‘ the race runs more ‘when’, we all know Putin can have a bad temper and holds grudges so I would expect the race to go off unhindered, even if there are more troops than spectators……. It’s so sad that people hide behind the name of a religion to justify their actions when the core of all faiths revolves around peace, love and kindness. Not sure if it’s on the level or Bahrain as its their regeme that has allegedly commited human rights offences on its own people. Where as in Russia it’s just separatist groups fighting amongst themselves I believe. Please correct me if I’m wrong. Yeah I don’t think it’s a religious thing there, more an independence issue. Probably like Ireland in the early 20th century. Bahrain is just an absolute monarchy, while the people there now probably want a transition to a parliamentary democracy. It comes to do elites in different forms everywhere in the world controlling the many, IMO, be it in a democracy or whatever form the countries are in. “She liked me better” or something along those lines.. add in the sexual innuendo.. Welcome to Italia – where kiddy-fiddling career criminals become prime minister and you’re incarcerated for texting, but not for hitting other people. Forza Italia! Are you seriously believing that in Italy the son of a politician will be sentenced? Depends on who that politician is, so that’s the same as anywhere else in the world i guess. Mr.Burgess is right, they were both sentenced to 6 months. ” kiddy-fiddling career criminals become prime minister” ha,ha, that made me laugh Danilo! You have to admit, never a dull moment with Silvio. 22 being his WDC winning number of course. Being a Red Bull sponsor is a good value, ex-post, just like it’s a great idea of invest in bitcoins 2 years ago.